Whether hepatic resection for multinodular hepatocellular carcinoma (HCC) is indicated remains to be demonstrated. We investigated the prognostic factors in a large series of patients treated with hepatic resection at a reference cancer center. All consecutive patients resected for multinodular HCC from January 2004 to April 2015 were reviewed. 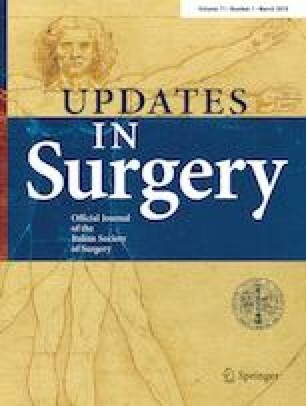 The study endpoints were the survival analysis and the definition of resection criteria. Among 380 patients resected for HCC, 116 (31%) were affected by multinodular HCC without macrovascular invasion. The median tumor number was 2 (range 2–30), while the median tumor size was 3.5 cm (range 1.1–28). The 90-day mortality was 2.6%. Morbidity was 31%. After a median follow-up of 31 months (range 3.1–149.7), the 1-, 3-, and 5-year overall survival rates were 85, 52, and 35%, respectively. At the multivariate analysis, tumor number more than 4 (HR = 2.15; 95% CI 1.8–4.18; P = 0.001), tumor size more than 6 cm (HR = 2.78; 95% CI 2.08–4.91; P = 0.001), esophageal varices (HR = 3.01; 95% CI 1.98–5.61; P = 0.002), and major hepatectomy (HR = 2.91; 95% CI 1.97–4.54; P = 0.001) were independently significant for survival. Median survival shifted from 20 to 52 months based on these factors. Hepatic resection for multinodular HCC may result in survival benefit for patients up to four tumors, none more than 6 cm, without varices, and eventually treated by conservative surgery. The study was conducted according with the Helsinki declaration about ethical standards. Moreover, it was approved by the local ethical committee of our institution. Informed consent was obtained by each patient included in the study.